Our own twist on a simple little recipe. A perfect addition to any holiday table, as an appetizer, a snack or a small after dinner dessert. We love cinnamon bread in our house. One day we were talking about mini-muffin snacks and someone said “why doesn’t anyone make cinnamon snack muffins”? And an idea was born. We started with a basic recipe and started tweaking it to a muffin we love. Combine all dry ingredients into a large bowl. Mix well! Add Milk to mixture, stir until soft dough forms. On a clean surface, sprinkle a slight covering of Bisquick. Empty dough onto the covered surface and knead at least 10 times. (Don’t knead dough more than 14 times). 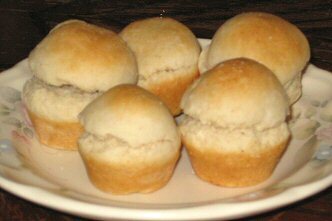 Roll small amounts of dough into 1×1 inch balls. Mix 1 tspn cinnamon with 1 tspn of Stevia for a diabetic Cinnamon Sugar. Don’t use cupcake paper holders. Lightly coat cupcake holes with butter or cooking spray. Don’t use too much! Lightly means you want just enough for the dough not to stick to the pan after cooking, but not so much to make the balls greasy. The best method is to use a non-stick baking sheet and if the balls stick, use a small knife to coax them out. Don’t roll balls too big. The dough should not be over the top of the cupcake hole. Instead of Cinnamon, use ¼ cup finely chopped cheese for Cheese Hats. Instead of Cinnamon, use cheese and brush melted Garlic on the top of each ball before baking for Garlic/Cheese Hats. Top Cinnamon Hats with an icy glaze. Serve Cinnamon Hats with your favorite fruit.